LA QUNITA, Calif. -- It's a hide-the-dog-hot morning in the Coachella Valley, so the throat numbingly cold banana smoothie presented by the smiling girl in the pressed khakis and yellow oxford tasted like the nectar of the gods. "Welcome to the Hideaway," she said before turning and disappearing into the quaint, Mediterranean flavored clubhouse. 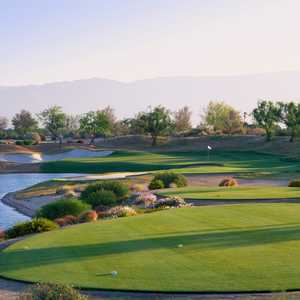 Welcome is something done to the nth degree here at The Hideaway at La Quinta, an unabashedly posh private golf club in a area known for its lavish offerings. And if the name doesn't ring a bell, there's a reason. The Hideaway is attempting to distance itself from its former life as the Country Club of the Desert. The checkered past of the CCD included allegations of missing money, the eventual indictment of original developer Jack Franks, resulting in a handful of disillusioned members. That past is fading faster than a sliced tee shot in the desert wind, however, with the financial backing of Nationwide Realty Investors and the steady guidance of the Discovery Land Company. In November of 2001, Nationwide scooped up the flailing CCD and brought in Discovery Land Company to resurrect the property. The San Francisco based development firm, fronted by visionary Mike Meldman, is the purveyor of a smattering of the country's top private clubs, The Estancia Club in Scottsdale, Ariz., the Vaquero Club in Westlake, Texas, Iron Horse in Whitefish, Montana and Mirabel in Carefree, Ariz., to name a few. Meldman's M.O. at The Hideaway was to start from scratch where needed, and to build on existing positives when warranted. A name change was the first order of business, and the chosen moniker harkens back to the Valley's roots as a hideaway for Hollywood's brightest stars. Also revamped was the CCD's original 54-hole golf master plan, which Discovery nixed in favor of a more intimate 36-hole version limited to 290 members per 18 holes. The property did come with a few perks. 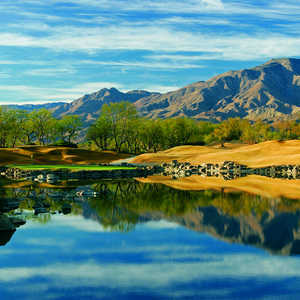 The existing 18-hole Pete Dye designed layout and the nine-hole track wrought by La Quinta resident and former European Tour player Clive Clark among them. With Dye's blessing, Discovery commissioned David Graham and P.B. Dye (Pete's nephew) to soften the Dye Course's penal bunkers and extreme contouring. They also gave the talented Clark the green light to design an additional nine holes. "The entire 36-holes should be open in February," said Steve Adelson, a senior vice president and partner with Discovery Land Company. "The goal is to be fully operational by the (winter) season." In the meantime, Discovery is killing the members with kindness and treating them to a delightfully contrasting 18-hole combination of Dye and Clark. The Clark front nine is considered the "playable" course, with its handsome collection of elevated tee boxes and salad bowl shaped fairways. The Dye back nine is considered the "players" course, and stretches to over 3,500 yards from the back tees. Off course, members enjoy a staff clad in shirts and ties, Titleist Pro V-1 range balls, appetizers at the turn, and in the near future, a 45,000 square foot Spanish Revival-styled clubhouse with spa, fine dining, fitness center, swimming pool and tennis courts. This swank epicenter also will house The Hideaway's Outdoor Pursuits desk, a Discovery trademark that essentially amounts to a personal concierge service. The original members -- once disenfranchised by the clandestine dealings of the CCD -- are pleased as punch. "The 68 founding members that were part of the investment team have been great ambassadors for us," Adelson said. There's no shortage of new blood, either. Adelson says more than 250 lots have been sold since Jan. 1. The 600-acre project will feature 580 lots and 490 residential units at build out, none of which come on the cheap. Lot prices range from $250,000 to over $1 million and semi-custom and custom homes range from $825,000 to over $6 million. The golf club is invitation only, private equity with an initial fee of $105,000. The 90-acres of finely manicured turf at this Tom Fazio designed masterpiece in the rustic dale of Carefree are hiding something -- 43 acres of Greg Norman designed golf course. Less than three years ago, Mirabel was actually a high-end, $15 million public course called Stonehaven that had been designed by the Shark at his minimalist best. Discovery purchased the property from Jerry Nelson, a principal in the development of Troon North in Scottsdale, in 2001. Meldman took one look at the tenuous, desert target style layout and placed a long distance call to Oz. "Our first move was to talk to Norman about it, but he wanted full fee to do it," said Adelson, who actually was lured away from Intrawest Golf by Meldman to manage the project. "We figured if we were going to pay full fee, we might as well go to our friend Tom Fazio. We'd worked with Tom at Estancia, and we were comfortable with him and in love with his product." Norman was appalled with the decision, calling Stonehaven the "best golf course nobody will ever play." Norman's design firm was appalled, saying Meldman had "more money than sense." None of this commentary phased Meldman, who coughed up another $15 million for Fazio to craft a course in keeping with the Discovery philosophy. "It was too difficult for our clientele," Adelson says. "These are folks paying a lot of money to play a high number of rounds. They like a challenge, but they don't want to be beat up all the time." Discovery also gave the residential master plan a major makeover and decreased the overall density by 25 percent. The result is a chic, private equity club that falls just below neighboring Estancia and Desert Mountain on the price spectrum, but rivals both in quality. "Estancia is a benchmark against which we measure all of our projects," Meldman said. "Though I recognize that natural elements of Estancia's site are incomparable, I firmly believe Mirabel has many of the same ingredients as Estancia -- great beauty, excellent location and enough movement to the land to give it a character all of its own." Mirabel's golf course is trademark Fazio -- artfully crafted holes with plump landing areas and knee-buckling approach shots to severely contoured greens. The 32,000 square foot, desert lodge style clubhouse (slated to open this Dec.) will house a spa, fitness center and pool with cabanas. Like The Hideaway, Mirabel is a private, invitation only equity club with a $105,000 initiation fee. Lots range from $250,000 to $800,000 and custom homes range from $1.2 million up to $8 million.